Our lab just moved to Bochum, so pay attention to our new contact details. Now we are part of the Ruhr-University and the LWL University Hospital Bochum: http://psychiatrie.lwl-uk-bochum.de/die-klinik/aktuelles/waz-medizinforum-psyche-und-ernaehrung. We are looking forward to new possibilities and associates! 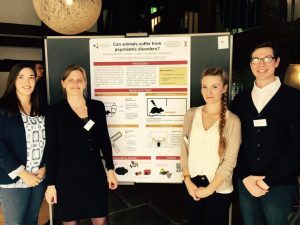 Charlotte, Dominik, Anna and Nadja will be at the interdisciplinary Workshop “Rational animals?” at the Ruhr-Universität Bochum. Have you ever wondered, if animals can suffer from psychiatric disorders and how we find out? Then check out our poster live on 5th October at the workshop.